Tartare Café + Wine Bar is launching a monthly event, Wine + Design, on the 1st of May which will explore the creative connection between food and the arts. On the first Wednesday of each month from 7:00pm to 8:00pm, Tartare Café + Wine Bar will host a local artist or designer, providing them with a platform to discuss their work, their inspirations, and what it means to be an artist in Galway. Each Wine + Design event will also see a talk and tasting of a selection of carefully-selected organic, natural, and biodynamic wines. Attendees will learn more about the creative winemaking process, and also look at the close relationship between the culinary and the artistic. Wine + Design gives artists a space to network and discuss their work. The first event, which is taking place on the 1st of May, will kick off with Peter Bradley of Grey + Ginger Clothing, co-creator of the wearable art brand that stands for individuality, social awareness, equality and acceptance of differences, who will be discussing the clothing brand as well as his fine art practice. Further artists confirmed to date include artistic director of Macnas, Noeline Kavanagh; artist & lightworker Finbar McHugh aka Finbar247; photographer Anita Murphy and stylist Zania Koppe of Ginger and Sage Photography; Elena Santos of Just Art It; Sandra Lovern of Lovern Leather Goods; and artist and curator of TULCA Festival of Visual Arts, Kerry Guinan. 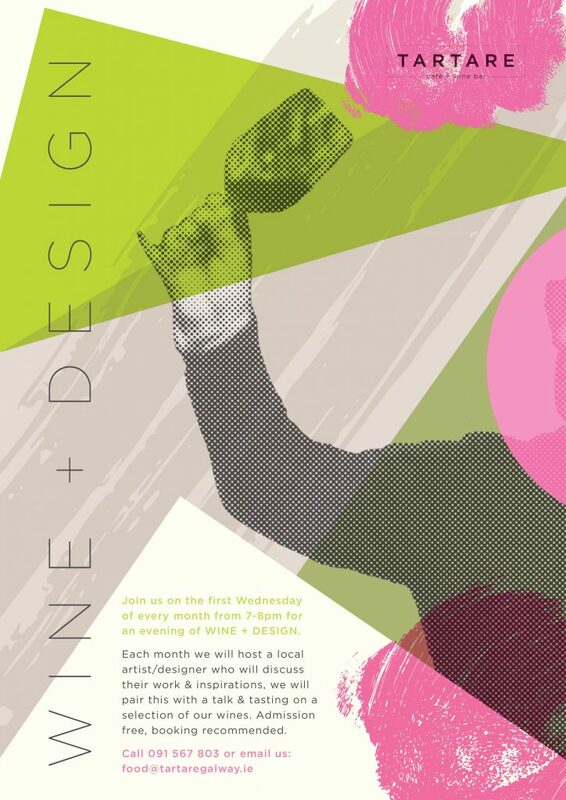 Wine & Design will take place on the first Wednesday of each month from 7:00pm to 8:00pm. The events are free however, booking is recommended. To book call (091) 567 803 or email food@tartaregalway.ie. Keep up to date with the latest news by following Tartare Café + Wine Bar on Facebook and Twitter @tartaregalway and Instagram @tartare_galway.